Who is David Stokes? He is that guy with the grey beard and bald head who happens to be a WI Association for Environmental Education Teacher of the Year, and an 'Aldo Leopold' awards winner. The Northshore United Educators (WEAC) honored David in March 2002 for educational excellence. David received the Master Front-Line Interpreter award from the National Association for Interpretation in November 2001. He sings and engages audiences of all ages in nature study. Using live creatures, animal artifacts, songs, and short stories, David gets down with his audiences, and makes learning fun. 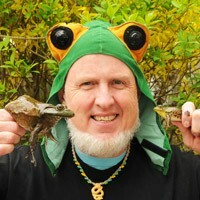 David has had his own business�The Frog Chorus Nature Education�since 2001. Prior to that, David worked for 18 years at the Schlitz Audubon Nature Center (National Audubon Society) in Milwaukee as Education Specialist and Director of Education.